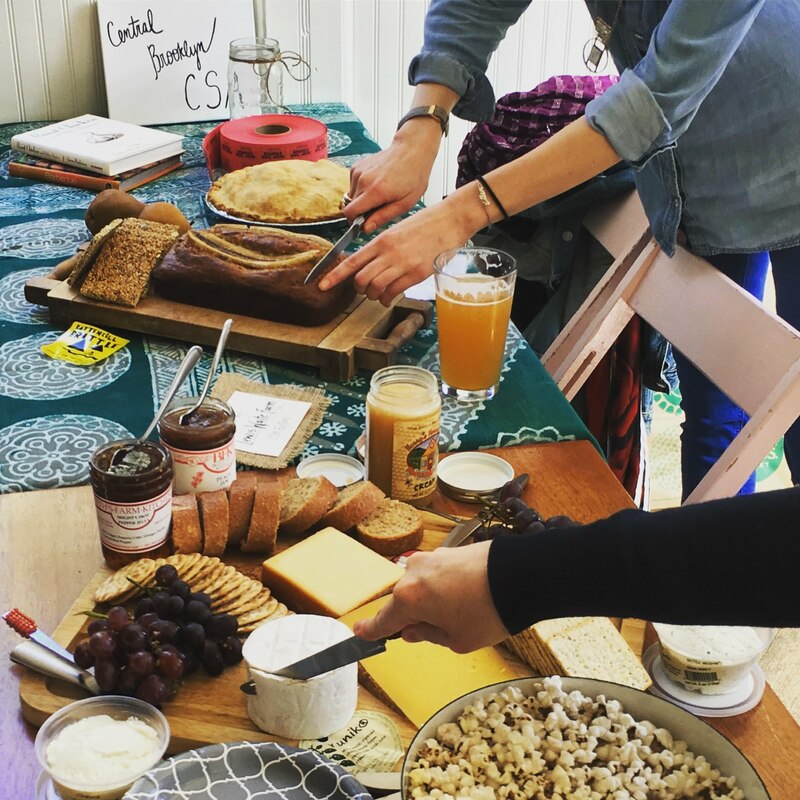 This week marks the final CSA week of the season. We are ready for a break; perhaps you are, too! The farm is cleaned up and cover crops have been sown on all the bare ground. Let the cold come! Everything has been harvested, or will be within a day or two, winter share crops are tucked away, fall planting has been wrapped up, temporary greenhouses have been dismantled and bags are packed for trips south and west. This week’s share. Sweet potatoes, kale, choy, your choice of spinach or lettuce, red and yellow onions, leeks, potatoes, scallions, celeriac (a bulbous root crop having the flavor of celery, and a flavorful addition to any root medley) and perhaps a little something else. I was once dressed as a celeriac for Halloween, wearing stuffed white leotards for the rootlets and bulb. I tell you this because Jan accompanied me in a chef’s outfit and served celeriac fritters that were the hit of the party. She cut them like fries, dipped them in batter, deep fried them (this may not be the healthiest of snacks) and served them in a light mustard sauce. Delicious! CSA Survey. You’ll find a link to our annual survey here: https://windflowerfarm.wufoo.com/forms/r1wtll4j1r7po72/. Please take a few minutes to tell us what you think. We want to make sure we are growing the kinds of CSA shares you want. What’s new at the farm? This week’s share is the last of the season. Before saying good bye, Jan, Nate and I would like to say thank you. Thanks very much to you for being a part of our CSA. We hope that your eating has been a little healthier and that you have enjoyed being more involved in your local community because of it. Your membership in our CSA provides good, meaningful employment for all of us on the farm, and it keeps the landscape in which we reside productive and healthy. Thanks to all of you for giving us the opportunity to pursue the craft we love. We’d also like to thank the volunteers who make the CSA work – the women and men in your neighborhood who organize the CSA. They work on newsletters and recipes, member recruitment, site management and work-shift coordination. Without the hard work of this core group, our little farm might not be in business. Thank you, thank you, thank you! Finally, we would like to thank our employees. We easily have the best farm team in the Hudson Valley and we couldn’t do what we do without them. Please come back! You’ll find a link to our winter share signup form below. The first winter share will be arriving on November 17th. We hope you’ll join us. Cold weather is expected this week, along with sunshine. Fall colors are fading, and final harvests are underway. This week’s share. Sweet potatoes, ginger, spinach, butternut squash, escarole (or kale), Koji (a dark green choy), fennel (bulbs and fronds), yellow onions, the last of our sweet peppers. Next week’s share is the very last of the season and will include a variety of greens and root crops. What’s new at the farm? Today, Jan, Nate and I are washing and sorting ginger for this week’s delivery and planting elderberries. The Medina clan is harvesting the last four caterpillar tunnels of sweet peppers and the last four beds of sweet potatoes. Collectively, we are wearing every manner of outdoor clothing, none of which is likely to be seen on this year’s fashion runways. Martin is wearing a matching tan Carhartt jacket and balaclava, with green rain pants and duck taped black rubber boots. Daniel, whose appearance is the most sophisticated among us, has on a set of bright orange Healy Hanson fishermen’s bibs over a black Hefty trash bag. He might have just come off an Alaskan trawler. I’m wearing EMS’s flannel lined dungarees, in blue, and a black Prava jacket I found at the second hand shop in town, neither of which, it turns out, is any good in the wet. Nate and Jan have been testing their new foul weather gear, most of which includes polypropylene and gore-tex and various shells, in part to keep them comfortable today, but also because we are heading off on a hiking trip the day after we make our last delivery, and they would like to know how well the stuff works. Our vacationing happens in the off season. Last year, we went to Acadia in coastal Maine in December and had the hiking trials to ourselves. This year, it will be Sierras and southern Utah in November. When we return, it will be just in time to prepare the first of your winter shares, and we’ll know exactly what to wear. This year’s surprise find is waterproof socks by Seal Skin (not real seal skins, of course).